Elliott & Associates tracks the number of radon mitigation systems that have been installed for each zip code since 1995. 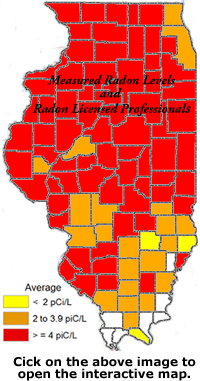 Clicking on the map of Illinois will open an interactive map of the state that displays average measured radon levels submitted to IEMA, color-coded by county. The map enables you to zoom in and out and to find average measured radon levels by county and zip code. Clicking on a county will bring up additional options for locating measurement and mitigation professionals as well as providing access to the measurement data for a specific county by zip code.